The international Committee to Protect Journalists (CPJ) reports that Cuba currently has arrested and jailed without charges two print journalists. They are Manuel Guerra Pérez, director of the independent bulletin Cimarrón de Mayabeque, and its editor, Lisbey Lora, who were arrested and detained on November 28, 2016. They were in the process of investigating for articles for their publication, which is part of the network of independent, local publications supported by the Cuban Institute for Free Expression and the Press. Guerra Pérez reported on local issues, including politics, corruption, and health conditions in the Cuban province of Mayabeque. This earlier report coincided with CPJ’s annual report listing Cuba as 10th on its list of the 10 worst censored countries in the world. These issues about freedom of the press in Cuba should be part of the U.S.-Cuba discussions about Cuban human rights that were covered in an earlier post about the U.S. Department of State’s report about Cuba’s human rights record for 2013 and that will be covered in the soon-to-be-released Department’s report for 2014. This List is part of CPJ’s Annual report, “Attacks on the Press,” to be released on April 27th. This post is based upon Comm. To Protect Journalists, 10 Most Censored Countries (April 21, 2015); Assoc. Press, Eritrea, North Korea Called World’s Most Censored States, N.Y. Times (April 21, 2015); Gladstone, Eritrea and North Korea Are World’s Most Censored Countries, Advocacy Group Says, N.Y. Times (April 21, 2015). Other posts discussed the Cuban Foreign Minister’s recent speech about its human rights, the U.N. Human Rights Council’s Universal Periodic Review of Cuba, the U.S. and Cuba’s having the same concept of human rights and the initial U.S.-Cuba discussions about U.S. and Cuban human rights. Establishment of “everyone’s right that information of public interest received through the media should be verified, balanced, contextualized and opportune” without defining those terms. Establishment of media’s responsibility to accept and promote obedience to the Constitution, the laws and the legitimate decisions of public authorities. Creation of the office of Superintendent of Information and Communication with the power to regulate the news media, investigate possible violations and impose potentially large fines. Creation of the Council for Media Regulation and Development headed by a representative of the President with the power to exact a public apology (and impose fines for repeat offenses) when media fail to accord someone the right to a correction or the right of reply. Retention of the system of “cadenas,” or official messages which all over-the-air TV and radio stations have to broadcast that the President and the National Assembly speaker may use whenever they think it necessary and that other public office holders may use for five minutes per week. Another provision on the surface may appear to be non-controversial: a requirement for allocation of broadcast frequencies (state, 34%; private, 33%; and community, 33%). Currently an estimated 60% are privately owned. Therefore, this requirement is seen as a means of the government’s closing privately owned media, presumably those critical of the government. Other provisions of the new law are more benign. It prohibits any form of censorship by government officials or civil servants, guarantees the right of journalists to protect their sources and to maintain professional confidentiality. Over 50 Colombian newspapers published a joint editorial condemning the law. Some Ecuadorian newspapers (Hoy and El Commercio) had similar criticisms. Human Rights Watch said the law “is yet another effort by President Correa to go after the independent media. The provisions for censorship and criminal prosecutions of journalists are clear attempts to silence criticism.” The law also was criticized by the Inter-American Press Association, Reporters Without Borders and the Committee To Protect Journalists. The law was defended by its author who is a member of President Correa’s political party and who said it will “protect freedom of speech with a focus on everybody’s rights, not just for a group of privileged.” Another member of that party who is the president of the legislature predicted that the law would promote more balanced news coverage. In his TV and radio speech to the country on June 15th President Correa said that law was a precedent that other Latin American countries would follow. Critics of the law, he said, were members of the “gallada” or club that opposes any regulation of the media. 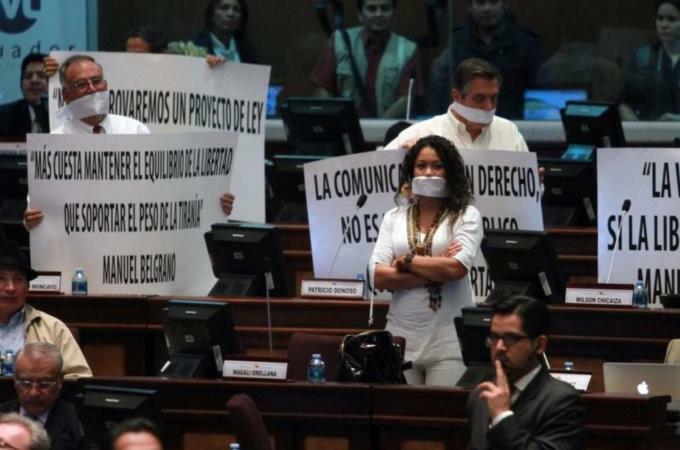 This is not the first effort by Ecuadorian President Rafael Correa to restrict the media. Such prior attempts have been protested by the previously mentioned NGO’s, the U.S. Department of State in its annual human rights reports and the Inter-American Commission on Human Rights. The Commission’s criticisms have caused Ecuador to launch a full-scale attack on the Commission that was not successful this last past March, but that Ecuador promises to keep pursuing. This summary of the new law is based upon articles in an Ecuadorian newspaper (Hoy), the New York Times and the Wall Street Journal and a commentary by Reporters Without Borders. As always, I invite others to provide comments to correct any errors of mine and to express other opinions about the new law.